Solid wood benches by Sawdust City are all hand made with pride in Eau Claire, Wisconsin. A wood bench can be such a great piece of furniture in any room, making the space seem warm and inviting. 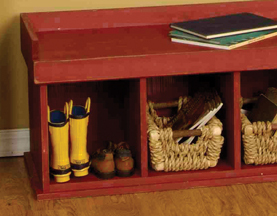 We offer thick rustic pine benches, painted wood benches, benches with storage, mudroom benches, and entryway benches. You can pick from over 40 color choices plus natural stain and poly finishes. We also offer solid cedar benches. Many of our solid pine benches are made to be part of our modular entryway and mudroom furniture systems. Our storage benches were featured in the New York Times! If you don't see a bench that is just right, we also build custom wood benches made to order!